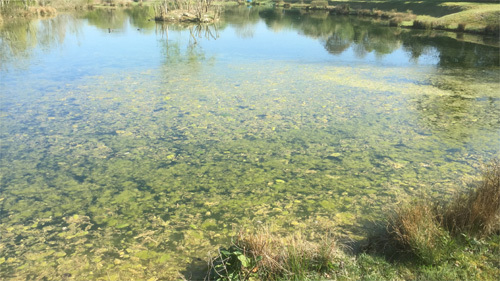 The presence of blanket weed in a pond or lake is unsightly, a hazard to fish and difficult to get rid of. To remove physically takes time and effort and the weed will regrow almost as fast as it is removed. The Smart Sonic ultrasound units are very efficient at killing blanket weed and if installed early in the year, before the weed has started to grow, then any growth is halted before it has a chance to become established. If a Smart Sonic ultrasound unit is installed once the blanket weed has become well established, the ultrasound will kill the blanket weed,turning it brown. 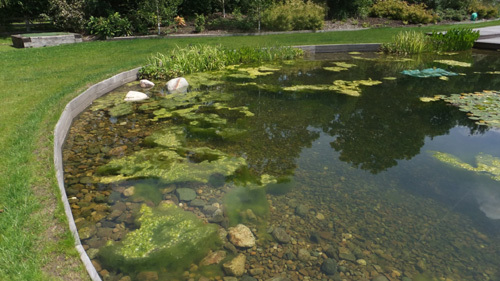 However, the dead weed will still have to be physically removed from the water and disposed of well away from the pool. Leaving dead weed on the edge of the pool means that as it rots, nutrient will return to the water, feeding further growth. In the above photograph, taken a few weeks after a PondTec ultrasound unit was installed (foreground), the blanket weed has almost all been eliminated, what little remained can be seen on the jetty on the right of the picture. 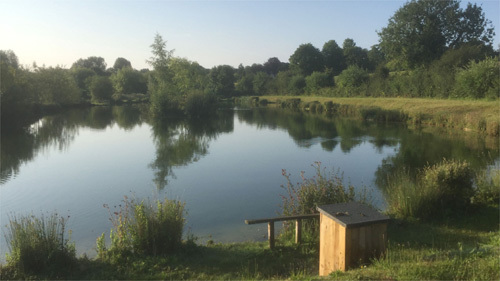 We were contacted by Will, the owner of this chalk stream fed trout fishery, because he continually suffered from blanket weed during the summer. Not only did it make the fishery look unattractive, but also made fly fishing almost impossible at times. Amport Fishery early in the year, showing the blanket weed growth. Amport fishery after 9 weeks treatment with Smart Sonic ultrasound, no blanket weed. New 2000 sq.m lake. First year clear. Second year massive blanket weed. Called Simon who installed a two transponder ultrasonic system. Effect? Third year a gin- clear lake . Happiness abounds. This system really works. The ultrasonic units are working a treat we have not he one single algae bloom this year which has probably saved me 8 hrs in every week so your system is worth every penny. 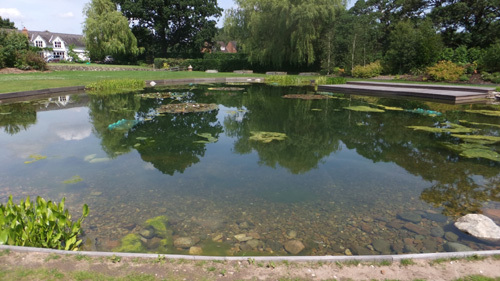 I know that I am not supposed to be astonished but the pond is usually covered in blanket weed by now but the only bit is in the little inlet to the side where the ultrasound can’t reach and I’m not bothered about that, the whole pond is otherwise clear. So absolutely terrific; I am thrilled as are the 8 swans that have adopted us! I am now going to order the trout, something that I never thought that I would be doing. Firstly, just to state that your equipment has been a great success this year, we could not have been happier. The hours of work it has saved us……. 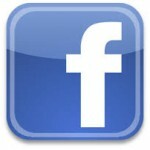 I am just sorry that we do not have any ‘truthful’ pictures to support our statements. N. B. 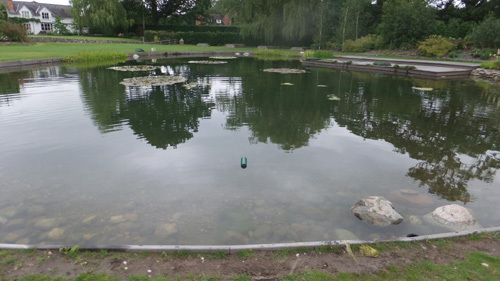 If a pond or lake has a heavy growth of submerged vegetation, then ultrasound is not an option, as the vegetation will disrupt the ultrasound signal, making in ineffective.